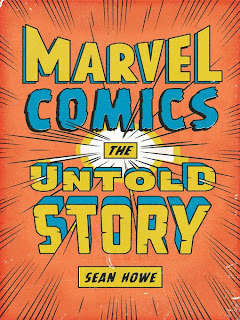 Sean Howe's Marvel Comics: The Untold Story goes on sale today. From someone who is primarily a DC Comics reader, I can commend the book to both Marvel and DC fans. Reading the book, I learned a considerable amount of history about Marvel, DC, and the comics industry in general (from when Marvel was Timely and DC was National, through to the founding of Image and Dark Horse and up to this past summer's Avengers movie). I also gained some context for the works of creators who, as someone who's mostly been on the DC side of things, were "new to me" -- Ann Nocenti, Fabian Nicieza, Scott Lobdell, Tom DeFalco, Bob Harras, and others. Howe's Marvel Comics is an informative read for any comics fan, but not a comfortable one. Era after era and decade after decade, Marvel Comics is a page-by-page chronicle of unrelenting in-fighting. Jack Kirby feuds with the company against a backdrop of Mad Men-esque martini lunches in the early chapters, Steve Gerber feuds with the company in the disco seventies, Chris Claremont feuds with the company in the eighties, Rob Liefeld feuds with the company in the nineties, and on and on. Someone is always angry. An overeager editor wrests control of a book from the writer. An oversensitive writer balks at the slightest change. The ever-changing management doesn't read comics. The business side incessantly pushes the editorial side to tell ridiculous, profit-driven stories. The mistakes of the past remain the mistakes of the present, through nearly seven decades of Marvel Comics. The loser in all of this is the reader. There are heroes in the book, like Claremont at the beginning of his X-Men work and Frank Miller at the beginning of his Daredevil work -- creators with the pure intentions of telling good and innovative stories. But there are even more examples of creators creating for themselves and not for the readers -- John Byrne sticking a parody of Marvel editor-in-chief Jim Shooter into DC's Legends; Jim Starlin satirizing Marvel's treatment of Roy Thomas in an issue of Warlock; Steve Englehart poking fun at Don McGregor in the pages of Avengers. Parody has its place, but there are times in Marvel Comics where the creators seem more interested in fighting their private battles on page than in telling a decent story. Lee and Kirby both appear impotent, fighting for a greater recognition that they don't achieve. They are both symbols of the mainstream comics industry over the last seventy years, only recently emerging as something more respectable than "just funnybooks." DC readers like myself will find plenty of parallels in the book between Marvel over the years and the current DC Comics New 52 initiative. In the 1980s, Jim Shooter suggest a "Big Bang" that would wipe out Marvel's continuity and start over, an idea so universally despised that, through a series of bizarre twists and turns, it costs Doug Moench his job (Shooter, if Howe's presentation of events is correct, must see some irony in Marvel following DC down the reboot rabbit hole with Marvel NOW!). In the 1990s, Marvel's titles are so editorially-driven that writers begin to leave rather than continue to rewrite; Bob Harras turns to Scott Lobdell for help -- then as today -- but even Lobdell has a story that must be re-written four times before editorial agrees on the contents. Also familiar to today's readers is this nugget from a 1994 speech by Frank Miller. "Marvel Comics is trying to sell you all on the notion that characters are the only important component of its comics. As if nobody had to create these characters, as if the audience is so brain-dead they can't tell a good job from a bad one." This is not far from Greg Rucka's recent explanation for why he's left both DC and Marvel, and certainly DC readers can see this in the revolving door of creators on some of DC's titles. Marvel Comics is, simply, disheartening, a testament that what goes on day by day to make the comics we love is exactly what every fan hopes doesn't go on -- cynical creators, a hostile work environment, decisions based on squeezing the last dollar from readers rather than on telling the best story. Some of this is in the telling; Howe's Marvel Comics is devoutly a business book, focused on the corporate ins and outs (most evident in the final, excruciatingly detailed look at Marvel's bankruptcy court proceedings). Marvel Comics is the antithesis of Grant Morrison's Supergods -- in relating every stumble along the way, Marvel's focus is too close to see the larger picture, that Marvel Comics has lasted in one form or another for over seventy years, that the adventures of Spider-Man have been continually published in one form or another for over fifty years. This is a book about Marvel's problems, not about its successes. Howe's Marvel Comics: The Untold Story is a good book, but it describes a poor situation, and at its worst, it suggests signs that history is repeating itself. Those who love comics should read this book, but be warned that Marvel Comics may test that love a little bit. Thanks for reviewing this book! Being a DC guy myself it wasn't even on my radar, but I love reading about the history of the comic book industry so this book sounds like a must-read for me. Thanks again for bringing it to my attention!